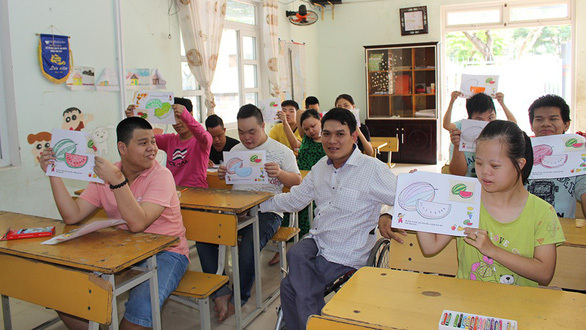 A handicapped Vietnamese man has spent the last 10 years teaching other disadvantaged children art and music at a center for the disabled so as to improve their conditions and help them recognize the most basic objects around them. Truong Tan Dung, 37, is currently a teacher at a center for Agent Orange-infected and disadvantaged children in the central city of Da Nang. At the center, he is not only the teacher of a class with 15 most serious cases of the facility, but he is also in charge of maintaining and managing its equipment and computers. At the age of three, Dung suffered from polio causing paralysis in his lower body and sensory paralysis in both of his arms. The misfortune of his childhood continued as his mother soon passed away and his father left, so the disabled boy grew up with his grandmother. As Dung showed his painting talent quite early in his life, he was able to support himself through adolescence by selling paintings. Shortly after, he recognized his passion for informatics, which he soon followed until he was able to land a job at the center as a computer technician. Ever since, he has been in charge of computers at the center while also teaching students with special needs, helping them improve their conditions. 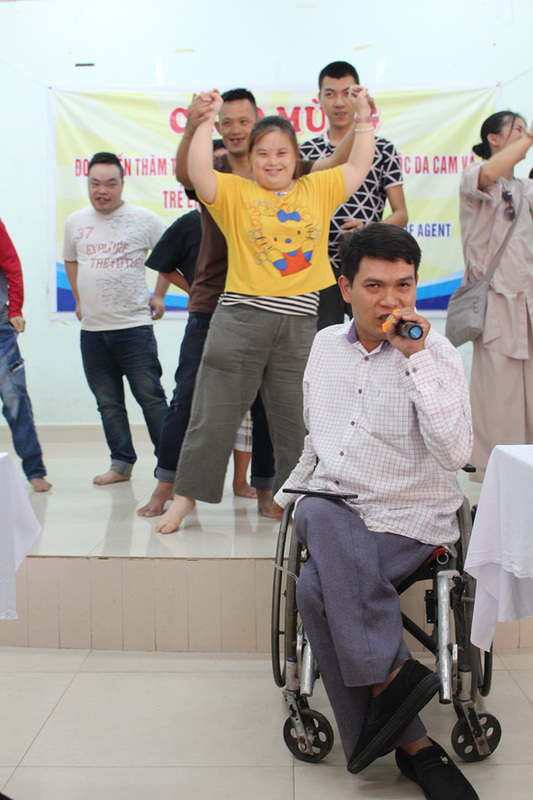 Dung’s class consists of 15 students in the most severe conditions of intellectual and physical disabilities, many caused by Agent Orange, a chemical weapon used by the U.S. military in their war in Vietnam that causes defects at birth. Simple coloring, holding pens, or responding to music are all challenging tasks for the students as they are used as forms of therapy to improve their conditions. At first many could not even recognize and name objects surrounding them but that has hugely improved through their painting activities, according to Dung. Another treatment the crippled teacher uses to help his students is music through singing and dancing. Hence, the class usually begins with the students’ singing and dancing to music, occasionally followed by Dung’s singing upon their request. Confined to a wheelchair, Dung had countless difficulties and doubts as he first indulged himself in this profession. “When I first started working at the center, I wanted to give up many times because I was too shocked to see the children’s conditions,” he admitted, adding that now he believes it is only fair that a disabled person teaches students with special needs as only he can truly place himself in their shoes. His perseverance and determination have helped him through the difficult times as now he is loved and adored by all of his students thanks to his whole-heartedness in helping them. So much is he adored that his students would ask him to sing for them at the beginning of the class as they all dance to the song, turning their class into “near-professional” musical performances. In Dung’s classroom, he wheels himself from one desk to another, from one corner of the class to the other in order to attend to each of the students just so that they know how to hold the pen properly and how to correctly color the pictures. Most of the students at the center forget what they learn almost immediately, with many unable to remember their own names for months, Vo Thi Thu, vice-director of the center, said, adding that it took Dung a great deal of time to teach the students things that seem simple to ordinary people. Sharing many difficulties with the students at the center, Dung is not only known as their teacher, but also as a friend and a mentor. Nowadays, for the more physically demanding tasks as a teacher of the disadvantaged, Dung receives help from the center's staff. Many of Dung’s students have greatly improved their condition and been moved to other classes, with some even starting to learn academic subjects. Others have also been able to have their own family, jobs, and been integrated into the society, Dung said. "Such cases are motivations for me," he proudly shared.